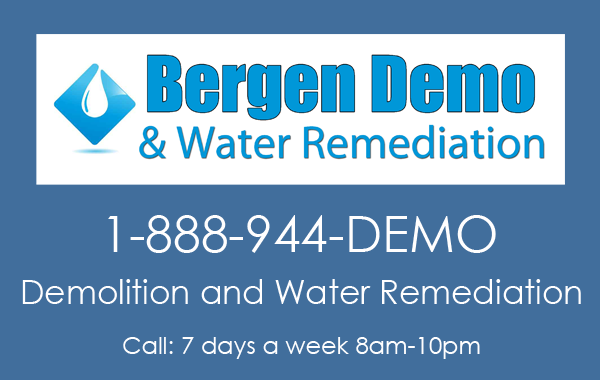 Bergen Demo & Water Remediation is a small family owned and light demolition business. We take pride in our work and the relationships we have with our clients. Whether you're a home owner or general contractor Bergen Demo & Water Remediation will get your demolition project completed on time and at a fare price. Water Remediation, Basement Pump Outs, Full Service Dehumidification, Kitchen gut, Bathroom gut, Basement gut, Sheetrock/dry wall removal, Above Ground Pool removal, Shed removal, fire and flood damage clean up and removal. Call us today, let Bergen take a look at your project so you can move forward. 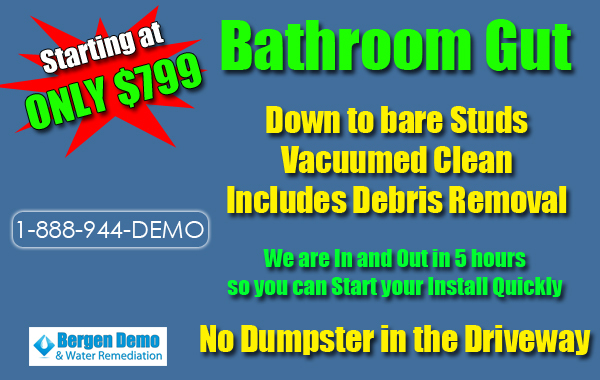 Contractors and Home Owners call us today for your Bathroom demolition. We will be in and out usually within a day, this allows you to start your installs quickly. We work swiftly and neatly and we remove all the debris and never drop a dumpster on your driveway. Contractors and Home Owners call us today for your Kitchen demolition. We will be in and out usually within a day, this allows you to start your installs quickly. We work swiftly and neatly and we remove all the debris and never drop a dumpster on your driveway. Metal and Wooden Shed Removal. We work swiftly and neatly. 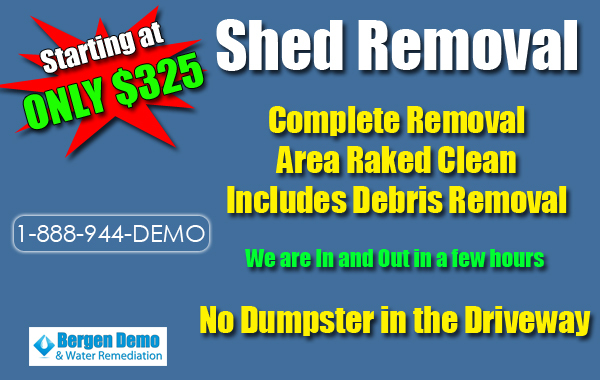 We remove all the debris and never put a dumpster on your driveway. Call us today for a Free Estimate. Bergen is a small family owned and operated light demolition business. We take pride in our work and the relationships we have with our clients. Wether you're a home owner or general contractor Bergen Demo & Water Remediation will get your project completed on time and at a fare price. Kitchen gut, Bathroom demolition, Basement gut, Sheetrock/dry wall removal, Above Ground Pool removal, Shed removal, fire and flood damage clean up and removal. Call us today, let Bergen take a look at your project so you can move forward. 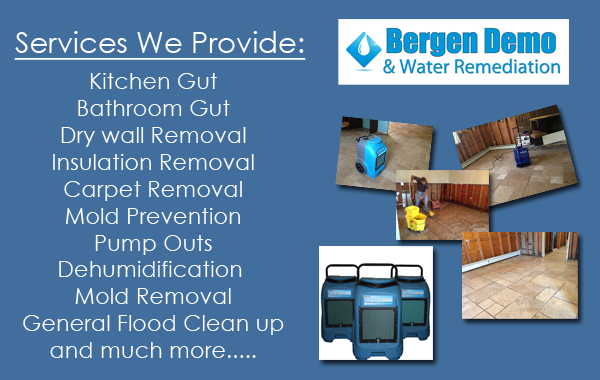 Bergen Demo & Water Remediation offers full water extraction and dehumidification services. 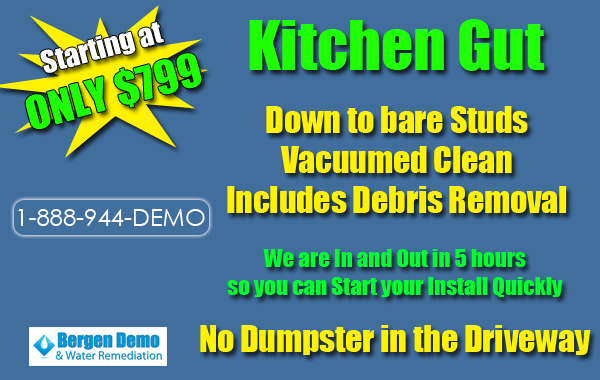 Big or small Bergen Demo & Water Remediation will get your project completed on time and for a fair price. Call us today.